If you've ever been to the funeral of a loved one, you can understand why many people believe that the death of our body means the end of our identity, the end of our thoughts and memories, the end of our consciousness. Your loved one, when alive, was warm, animated and engaged with life. Now they are cold and still and totally disconnected from life. All that you knew them to be is gone, seemingly never to see or be seen again. I read somewhere that one of the distinguishing characteristics of mankind is that man is the only animal that knows he is going to die. Although everything dies, only man knows that includes him. But why do we fear it? When somebody dies, only the mortal remains are left behind. What happens to our consciousness? Do you have a body? Or are you a body? Is your body 'you'? Or is your body your possession? An atheist would argue that the body and the consciousness are one and the same. When the body dies, the consciousness dies as well. In this view, you are your body. There is no 'ghost in the machine'. Your brain produces your mind, and your mind is what makes you think that you are you. The atheist credits 'reason' for his reaching this 'enlightened' perspective. But to qualify as an atheist, one must know EXACTLY what happens to the mind, will and emotions when the body dies. If they even entertain the possibility that death is a great unknown, then they are not atheists. They are now agnostics. ". . . all the days of my appointed time will I wait, till my change come. 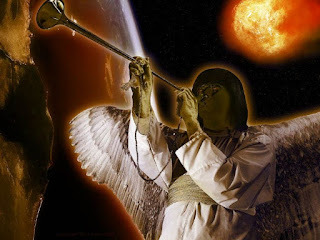 . . "
Job awaited the call of the trumpet at the Rapture, thousands of years before it was generally known as doctrine. But in all these Scriptures, the reference is to the PHYSICAL body which is 'asleep' -- and NOT the spirit. Solomon addressed the eventual end of both body AND spirit. The rich man was conscious of his torment, was capable of addressing Abraham, and was aware of Lazarus. Abraham was equally conscious of HIS surroundings, as well as those of the rich man, and was capable of giving reply. His PHYSICAL body was dead (or 'asleep') but his soul was very much 'alive' in the sense of his consciousness. So, what happens when we die? We are absent from the body, but there is no cessation of consciousness until the resurrection. Those who are 'asleep' in Christ are those who have experienced PHYSICAL death, but are consciously very much alive in His presence. Our loved ones who have gone home to the Lord are ALREADY in His Presence, enjoying Heaven and its unimaginable joy and riches. They are NOT mouldering in the grave, unconsciously awaiting the call of the Trumpet. "Wherefore, comfort one another with these words." Another alignment happens with the Great Pyramid on September 20, 2017. This date juxtaposed to the Sign of the Woman on September 23, 2017. This alignment will not happen again either. 3 planets align over the 3 pyramids of Giza, 3 days before September 23, 2017 and form the “Christ Angle” that points at Israel. Trump family bought the most expensive single building ever purchased in the United States, at 666 Fifth Avenue. $1.8 billion was paid for this property (18 = 3*6 = 666). – Trump’s Father was Frederick Christ Trump, Mother was Mary Trump. Trumps Father, Fred Christ Trump died on 6/25/1999 and from this date until the Revelation 12 sign on 9/23/2017 is 6666 days. Elisabeth CHRIST, Trumps grandmother (Her last name was Christ) was born on October 10, 1880 in Kallstadt, Pfalz, Germany and died on June 6, 1966 ( 6/6/66 (666) Queens, New York and was considered the Matriarch of the Trump empire. –Queen Elizabeth will be 33,333 days old on 7/25/2017 ( 7 ( 5 + 2) 2017 or 7/7/2017). – The first atomic detonation was named the “TRINITY” and it occurred on 7/16/1945. The distance between Elisabeth birth on 10/10/1890 and the atomic detonation blast on 7/16/1945 was 64 years 9 months or 777 months. – From World War II ending on 9/2/1945 to Trumps birth 6/14/1946 = 9 months 11 days or 911 and from the first atomic detonation at Trinity 7/16/1945 to Trumps Birth 6/14/1946 = 333 days. – Trump was finalized with 304 electoral votes (3 + 4 = 7) – 7 days after November 7th (Election Eve) was the largest Supermoon in 70 years.
. – Trump’s campaign manager and current advisor Kellyanne Conway was born in 1967 – the year Jerusalem was recaptured. – Syria was attacked on Trump’s 77 day in office; Putin was 777 months old at his first meeting with Trump on 7/7/2017 and the meeting was mainly about Syria. The meeting was also 77 days from the Revelation 12 sign. -Netanyahu was born on the 7 + 7 + 7 (21 day of October 1949 and graduated high school in 1967 and graduated from MIT in 1977. -It will be 444 weeks from Obama’s first inauguration to 7/25/2017 ( 7 ( 5 + 2) 2017 or 7/7/2017). It will also be 3333 days from Obama’s first nomination to the same date. -From Netanyahu’s first day in office to Trump’s election was 7 years, 7 months, and 7 days. -When Pigeon Forge burned and the Joel 2 passage proclaiming the Day of the LORD was at hand was discovered was 57 days before the first day of Hebrew year 5777. - 4/6 Carolina at the 33rd parallel. – add both together and total time is 7 minutes even. – same exact time of sunset in Jerusalem. – 7 years later another eclipse, and both form a X over the United States that rests right over a region in southern Illinois called “Little Egypt”. The exact point where the two paths cross is in the town of Makanda, which used to be called the “Star of Egypt”. – The first major city that will witness the eclipse is Oregon’s state capital, Salem. Salem is the shortened version of “Jerusalem”, which is the most prophetically significant city in the entire Bible. Jerusalem was originally called Salem in the days of Melchizedek (Genesis 14:18) and the closest road to the exact point where the two eclipses cross is Salem Road in Makanda, Illinois. – The eclipse touches all 3 major earthquake fault lines of the United States. The eclipse will be the first total solar eclipse that only affects the United States since 1776, founding of the country. The Wisemen’s journey and more thought provoking items. Wise men’s journey was estimated around 2 years in length. They followed the Star of Bethlehem. Star of Bethlehem resurfaced June 30, 2015 leading us to summer/fall of 2017. – September 23, 2017 – 2+/- year journey anyone? None of this takes into consideration of the events in September of 2015 or September of 2016, both of which were filled with more possible end-time events than any previous years of a single month. Importance of these numbers in the Bible..
– we even have Noah’s ark launched 1 year before 7/7/2017. -40 means testing, 40 years of wandering 50 means release of debt Shabbat Shuva begins at sundown on Fri, 22 September 2017. -This Shabbat is named after the first word of the Haftarah (Hosea 14:2- 10) and literally means “Return!” -2017 to 2024 offers the only noticeable timeline where the Tribulation of 2550 days could begin unquestionably on a Fall Feast date and end on a Fall Feast date. -The alignment is so shocking that exactly 2550 days fits with the Tribulation beginning on the last day of the last Fall Feast on Tabernacles, October 11th, 2017 and ending on the first day of the first Fall Feast which is Rosh Hashanah, October 4th, 2024. -This is interesting in light of that Jesus will fulfill the final three Fall Feasts in short, subsequent order while on earth, just as He fulfilled the Spring Feasts already. This timeline would also allow the Second Coming could be on the Feast of Trumpets in 2024, allowing Jesus to fulfill that feast AND followed 10 days later by a fulfillment of the Day of Atonement, and 5 days after that by a fulfillment of the Feast of Tabernacles. Stay tuned! I don’t know how legal it is for me to share this on the web site but I want to make sure you know where I found it or how it was sent to me. All About The Numbers This is too shocking or possibly important to not share with you. Pray for the peace of Jerusalem, for our son and all the IDF soldiers. WHAT IS A BIBLICAL RAPTURE? These days we are witnessing a threefold division among theologians concerning the question of when the Rapture of the Church will take place. It is not so much the exact timing which is the bone of contention, but more the question when it will take place with regard to Daniel's last week of years. 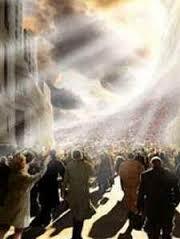 The Rapture takes place before Daniel's 70th week of years begins. The Rapture takes place during Daniel's 70th week of years. The Rapture takes place after Daniel's 70th week of years. Camp 3 by far is the biggest because of all the Amillennialists including Catholicism, Protestantism, Orthodoxy and quite a number of smaller denominations. Camp 2 is much smaller than camp 3 yet still larger than camp 1. And some are abandoning camp 1 as they see Daniel's last week of years approaching rapidly, but the Rapture has not yet occurred. Maybe they are seeking doctrinally safer ground and therefore warn and switch to prepper mode in camp 2. Reading the Scriptures it appears that always the smallest and most marginalized group had it right and is called the "remnant" for this reason. Yet all these camps and questions would not exist, if the Word of God was taken literally to clarify what the biblical definition of a rapture is. God gave us quite a number of examples for us in order that we can understand what He says a rapture is and what purpose it fulfils. "Enoch walked with God: and he was not; for God took him." Let's glean some information from these two reports. In Enoch's case we sense already some kind of concealed force in the wording "he was not, for God took him." Yet in the account of Elijah this removing someone forcefully is not concealed any more. Fire, whirlwind, and to part asunder are terms of force. So raptures seem to have the character of forcefully determined action on God's side. We will rediscover this in other raptures as well. But as we continue reading the historical aftermath of these two raptures, we discover that the raptured men were saved from severe judgment. Enoch was spared to live in a time of cross-breeding experiments as we read in Jasher 4:18, which angered God to the point He sent judgment, unleashing a series of great wars between the posterities of Seth and Cain (Josephus, Antiquities of the Jews 1.2.2 and 2.3.1). Elijah did not have to experience the further moral decline of Israel and its final destruction in God's judgment executed against Israel by the Assyrians. Yet there are other examples of raptures in the Bible, but before looking at them we should understand, that in some raptures men of God are taken to heaven while in other cases they stay on earth. The second rapture in history is of this kind. It is the rapture of Noah from the judgment of drowning in a global deluge. Noah was righteous (Gen.7:1) and hence called to enter the ark. Also Enoch was a righteous man who walked with God. The same can be said about Elijah considering the account of his walk with God. Now, Noah was called to enter the ark. This of course is not to be considered forceful, but yet it was an order. God commanded Noah to build the ark and He commanded him to enter it. And again the reason fulfills the pattern of rescuing a righteous man from the impending judgment of drowning and losing everything. The most informative example of a rapture is the one of Lot from Sodom and Gomorrah. Lot was a righteous man, we learn in 2 Peter 2:7. In Genesis.19:1, two angels meet Lot and tell him (Gen.19, 13) that they will destroy the cities. They give him time till next morning to gather his sons in law, but when they see Lot tarrying they use gentle force and brought Lot and his family out of the city (Gen.19:16). Then Lot is instructed to flee to the mountains. By this time Lot is already in his eighties or even nineties. He argues that he will not make it there and also points out that there are dangers (Gen.19:19). And here is the point: He is granted relief in that he is allowed to flee to a little town nearby called Zoar. One of the angels tells him, that Zoar originally was on the hit list of destruction, yet Lot's plea got Zoar off this list. Also Lot is told to hurry, "for I cannot do anything till thou be come thither," the angel says. This is remarkable to say the least. Not only Lot's plea not to be sent to the dangerous mountain area is granted, which saves a hole city, but also Lot is told, that the impending judgment cannot begin until he is saved. Here we see one very important element of a rapture: The Rapture is performed with the sole reason of removing the righteous from where impending judgment will hit. And the judgment cannot take place as long as any one of the righteous is still in the area and time of where and when the judgment will strike. The story of Lot reveals a very strong trait of God's righteousness. God will never ever judge a righteous person! He cannot do this! If He did, His own righteousness would cease to exist, because God would have lied. Either would He lie by indicting a righteous person, or He would have lied in the past when having called someone righteous although he is not. So what we see in Lot's rapture from Sodom and Gomorrah is an inherent feature of all raptures, and it has to be lest God is a liar. God imbues those who seek Him earnestly with righteousness by grace. He smites those who reject Him. If we apply these insights to the Rapture of the Church, there is no question as to when it has to take place: Clearly before the judgment. And to be clear: The four horsemen of Revelation 6 are the first judgments triggered by Jesus, the Lamb. So the Church has to be removed from earth by then. And here is a severe warning to those who teach otherwise: If you place the Body of Christ into Daniel's 70th week -often called the Tribulation-you are calling God a liar. Not for one moment do I think that this is intentional. Mostly it is well-meant to warn people to prepare. But well-meant is not necessarily well done. Describing God is an impossible task. Nobody today has actually seen Him. We know Him by what we read in Scripture, which describes His characteristics and not His physical appearance. Let's take a look at a few of those characteristics and see if we can know God better. God is Spirit. "But the hour cometh, and now is, when the true worshippers shall worship the Father in the spirit and in truth: for the Father seeketh such to worship him. God is a Spirit: and they that worship him must worship him in spirit and in truth." John 4:23-24.The story behind this passage is that Jesus, God incarnate, and His disciples were passing through Samaria and stopped at a well. The disciples went into the town to buy food when a woman came to the well to draw water. Jesus began a conversation with her, which quickly turned to her moral state and the Living Water which Jesus could give to her. She was interested and spoke of worshipping in Jerusalem as opposed to worshipping elsewhere. Jesus explained that a time was coming when worship would change. After Jesus ascended into Heaven the Holy Spirit was given to indwell Christians. "Know ye not that ye are the temple of God, and that the Spirit of God dwelleth in you?" 1 Corinthians 3:16. When a person truly accepts Christ he or she is indwelt by the Spirit of God. Years after the conversation with the Samaritan woman the Jewish temple was destroyed; no longer could worship take place in Jerusalem. Christians today are the temple of God. We worship in spirit and in truth. God is spirit. God is eternal. God has always existed and always will exist. When God spoke to Moses from the burning bush, God directed him to go to Pharaoh and tell him to set the Israelites free from their slavery. The Israelites had been in slavery in Egypt for centuries and they finally cried out to God. Moses was an Israelite who had been raised in Pharaoh's palace but had fled Egypt 40 years earlier after killing an Egyptian soldier. He needed to know what authority he could give the Israelites when he obtained their release. "And God said unto Moses, I AM THAT I AM: and he said Thus shalt thou say unto the children of Israel, I AM hath sent me unto you." Exodus 3:14. That is a present tense statement. He didn't say "I was that I was" or "I will be". He has always been. Many years later Jesus riled the Pharisees when He claimed to be the voice from that bush. "Jesus said unto them, Verily, verily I say unto you, Before Abraham was, I am." John 8:58. Jesus said He is God. Our English translations don't make it clear, but the Pharisees knew. The next verse says that they took up stones to stone Him. Claiming to be God was a stoning offence. There are many verses that speak of the eternal nature of God. We know that "In the beginning God created the heaven and the earth." Genesis 1:1, and a prayer of Moses recorded in Psalms says "Before the mountains were brought forth, or ever thou hadst formed the earth and the world, even from everlasting to everlasting, thou art God." Psalm 90:2. In the Book of Revelation, Jesus says "I am Alpha and Omega, the beginning and the ending, saith the Lord, which is, and which was, and which is to come, the Almighty." Revelation 1:8. God is eternal. God is love. "He that loveth not knoweth not God; for God is love." 1 John 4:8. What a blessing to know that God loves me. More than that, He IS love. Because He loves us He wants the best for us, so He sets rules. When I was a child I would get upset when my parents wouldn't let me do just what I wanted. "When I grow up and have kids I'll let them do whatever they want!" Silly me. As I matured I realized that because they loved me my parents set rules for behavior. This is just a hint of God's. Like rebellious children we want our own way and that's why God has tried to teach us right from wrong. The Law was a teacher. "Wherefore the law was our schoolmaster to bring us unto Christ, that we might be justified by faith." Galatians 3:24. It's easy to understand why many of the laws were there. Honor God is obvious. Don't murder and be sexually pure are also obvious, but some others are a bit more subtle. "Why can't I do just what I want", ask the rebellious children. "Because I love you", says the loving God. Jesus said "This is my commandment, That ye love one another, as I have loved you. Greater love hath no man than this, that a man lay down his life for his friends." John 15:12-13. Jesus (God the Son) did just that. He left His perfect home in Heaven and entered this fallen world. Here He was rejected, mocked, beaten, spit upon, and crucified. He knew before He laid the foundations of the earth that this would happen, but He is love and became flesh in order to bring salvation to a sinner such as me. It's a free gift, but you need to accept that gift in order for it to apply to you. "For God so loved the world that he gave his only begotten Son, that whosoever believeth in him should not perish, but have everlasting life." John 3:16. God is love. God is faithful. We can always trust God to be there because He is faithful even if we aren't. We fall into sin regularly. We need to break our sin habit, but it always seems to stumble us when we're weak. "There hath no temptation taken you but such as is common to man: but God is faithful, who will not suffer you to be tempted above that ye are able; but will with the temptation also make a way to escape, that ye may be able to bear it." 1 Corinthians 10:13. When temptations come our way we usually know we're being tempted to sin. That's when we turn to God. Ask Him for the strength to resist the temptation. He will either remove the temptation or help you to not participate in the sin. What happens if we just go ahead and sin anyway? He's still faithful. "If we confess our sins, he is faithful and just to forgive us our sins, and to cleanse us from all unrighteousness." 1 John 1:9. What a comfort to know that even when we sin He still loves us. It's important to talk to Him about the sin. Tell Him you're sorry and ask His forgiveness. He knows every sin you will ever commit and when you truly accepted His gift of salvation all of your sins were forgiven. When you ask Him to forgive you that shows that you're growing in your walk with Him. Babes in Christ are often unaware of what exactly is sin, but as we grow in Christ we become more aware of our sin. Asking forgiveness is humbling and shows respect for God. God will always forgive. God is faithful. God is the God of the living. Ever since Adam and Eve were expelled from the Garden of Eden death has been a part of this world. They were separated from God because of sin and when they died their souls went into sheol..the abode of the dead. There were two sides to sheol, one of torment and one of comfort. Those who obeyed God and looked forward to the coming of the Messiah went to the place of comfort. God never forgot them. When Moses went up on Mount Sinai, God spoke with him and said "Moreover he said, I am the God of thy father, the God of Abraham, the God of Isaac, and the God of Jacob. And Moses hid his face; for he was afraid to look upon God." Exodus 3:6. They died in faith. Hebrews chapter 11 gives examples of many who died prior to Jesus first coming, but they looked forward in faith to the coming Messiah so they are still living, as are all people who have died in faith. After His death on the cross, Jesus took those faithful souls to Heaven. Those who have died rejecting the Messiah, whether before or after the cross, are also alive but are awaiting the final judgment and eternal death. Because they rejected Him in life, He is not their God in death. God is the God of the Living. God is light. When we walk in the dark it's easy to stumble and fall. We need light to find our way and see obstacles in our path. The same is true in life. Darkness is all around us...the Satanic darkness of sin. We need light to find our way "This then is the message which we have heard of him, and declare unto you, that God is light, and in him is no darkness at all." 1 John 1:5. If our focus is on the things of the world we walk in darkness and it's easy to fall into sin. If we fill our life with the works of Satan we fill our life with darkness. A Christian should fill every part of life with the Light of God. "Take heed therefore that the light which is in thee be not darkness. If thy whole body therefore be full of light, having no part dark, the whole shall be full of light, as when the bright shining of a candle doth give thee light." Luke 11:35-36. What is shining from you? Is it darkness that comes from Satan or is it the pure light that shines from God. We choose what we allow inside of us and God's light is what we need to allow in. God is light. God is changeless. Many things in life change over the years, such as hair color, friendships, jobs, and much more. We can count on the fact the God never changes. "Jesus Christ the same yesterday, and to day, and for ever." Hebrews 13:8. We can rest assured that when we read Scripture, what was true in Genesis is true today because God is the same. Many people arrogantly criticize God as seen in the Old Testament because He seems angry. That shows they don't study Scripture. His love for humans has always been there. His judgment never came quickly. The wickedness prior to the Flood corrupted all of creation, but God warned people and gave them time to repent before His judgment came. There were only 8 people who were uncorrupted and had He waited there would have been no one left to save. The people in Sodom and Gomorrah had committed horrendous sin and God wanted them to repent. It wasn't until only Lot and his family were left who weren't totally depraved that God sent judgment on these wicked cities. "Thy word is true from the beginning: and every one of thy righteous judgments endureth for ever." Psalm 119:160. We need to take heed that we aren't following the wrong path and are tempting God's judgment. Study the reasons behind God's judgments to see His love. Be assured that God is still righteous in His judgments today, but the difference is the cross. Because Jesus shed His blood to purchase our redemption we can escape judgment if we accept His sacrifice. "And as Moses lifted up the serpent in the wilderness, even so must the Son of man be lifted up: that whosoever believeth in him should not perish, but have eternal life...For God sent not his Son into the world to condemn the world; but that the world through him might be saved." John 3:14-15, & 17. Sin will always condemn us, but God's love will always save us. God is changeless. We could go through many more things that God is, but you can find them for yourself. God is the author of peace, God is true, God is One God, and many more. You will find it very rewarding to search who God is, and be blessed by what you learn. The Seven Trumpets are for saints, not to deliver us but to avenge us on our haters. God is a just God and our day is coming when our enemies will regret their hatred. Notice how the entire action of these trumpeters is preceded by the culmination of the effect of our prayers. Every time you pray for your enemies you are laying the foundation of their judgment. These trumpets, including the final one, have absolutely nothing to do with the Rapture but everything to do with justice for us. The coming judgment is proof God loves His saints. 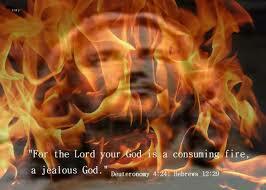 The fire falling on the wicked is purifying the world for us. Every visage of our suffering for Christ will be vindicated. God is establishing a wall between the righteous and the wicked. The wicked will be turned on the wicked. Satan will be allowed to make a fool of himself. 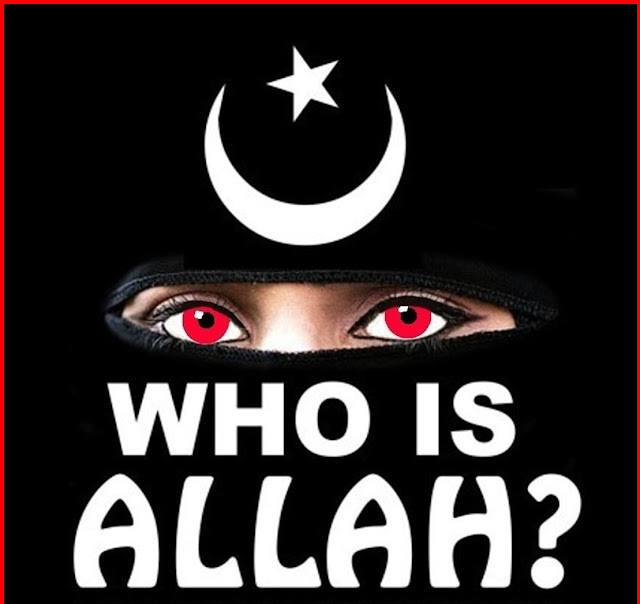 Even the One World Religion is hated by her creators. The center of the One World Religion is burned to ashes. God is showing us a picture of the consequences of wickedness. The Seven Trumpets are all about the price of godless action and Satan's failures. The true saints of God will never suffer in vain. Every heart-rending prayer, every period of great intercession for the kingdom of God to come, and every person that endures tribulation, persecution, or temptation will be avenged and rewarded for their faithfulness. You cannot give a cup of water to a righteous person and not be guaranteed your reward, "For whosever shall give you a cup of water to drink in My name because ye belong to Christ, verily I say unto you, he shall not lose his reward." Mark 9:41. The Father and His Son never redeem a person in vain and will never fail to justify, sanctify, and multiply those overcoming saints that take up their cross and follow Him. When the books are opened and the time of the reconciliation of all things has come, the faithful believers will discover that the Father has planned the end perfectly. The Apostle Paul said it beautiful, "But as it is written, Eye hath not seen, nor ear heard, neither have entered into the heart of man, the things which God hath prepared for them that love him." 1 Corinthians 2:9. This great chapter of the Book of Revelation is mainly about the avenging of His Saints. Even the attention-getting first verse suggests great things to come. The Bible and secular history is replete with the injustice and persecution of the righteous people of the earth. It has always cost to be an all out Bible-believer and to live the genuine life of a Bible-believing person. When the converted man or woman has stepped out of darkness into the light, the light will never fail to shine from that converted person, and darkness will be offended. "These things I have spoken unto you, that in me ye might have peace. In the world ye shall have tribulation: but be of good cheer; I have overcome the world." John 16:33. They may not hate us, but the enemy that rules their lives will hate the light that uncovers their deeds. It cannot fail unless the heart of the wicked is open to be converted themselves! Revelation chapter eight is the supernatural beginning of the avenging of His saints. Vengeance is evil in the hands of men, but righteous in the hands of God. Then, it is called justice. This promise has been left to us and we are to leave vengeance in His hands and wait for the right to prevail. It is impossible for right not to prevail if we will keep our hands free and our heart full of patience and faith. "Dearly beloved, avenge not yourselves, but rather give place unto wrath: for it is written, Vengeance is mine; I will repay, saith the Lord." Romans 12:19. Every act of wickedness against righteousness will be perfectly vindicated, and every unrepentant sinner will answer for his sins. The entire Book of Revelation is about justice and redemption. It's impossible to have one without the other. There is no perfect redemption without justice and there is no true justice without redemption. Our Father has never condemned the righteous with the wicked. Justice is the principle reason that the Rapture must occur before the seven dark years of tribulation. When the Creator judged the earth with a flood, Noah had to be removed first. "But Noah found grace in the eyes of the LORD." Genesis 6:8. When Sodom and Gomorrah went up in flames, Lot had to be removed first. The angel said, "Haste thee, escape thither for I cannot do any thing till thou be come thither" Genesis 19:22. Any person that unfairly judges the righteous is laying a snare for themselves. When you are unfairly treated, put it in God's hand and go on in righteousness. Forgive and forget! "And when he had opened the seventh seal, there was silence in heaven about the space of half an hour. Revelation 8:1. The Lamb, the Son of God, will open all seven seals. This is clearly His activity. Nothing makes this book so breathtaking as the proximity of everything and every event to the Lamb and to His Father on His throne. This seal and its opening startled Heaven into silence. The entire populace of Heavenly Jerusalem has anxiously waited for the day when Satan will be judged and evicted from the universe. The angels are well aware of the broken heart of God over man's first rebellion and even more conscious of the moments surrounding the death of the Son of God to redeem. That redeemed host from the earth has joined the Heavenly hosts. A holy awe envelops this city and even the "Holy, Holy, Holies" of the Seraphim and Cherubim revere the call of silence as preparation is made to avenge the overcomers out of a sin cursed world. Recording angels have never missed an event on God's earth. Every injustice is daily recorded. Every sin that has not been removed by the Lamb's blood is written and awaiting justice. The acts of wicked men to destroy the righteous are perfectly prepared for this hour. And as stupendous as it may seem, every saintly prayer and every weeping believer waiting on His God and crying out for mercy, both for themselves and others, is all recorded. The prayer of the saints will soon become fire in the earth and the books have it all on record. Seven angels with seven trumpets and the angels are coming straight from the Father's presence. This is the only opening of the seven seals that special angels are given special prominence and that the prominence has the favor of the Father. Of course, all of the activities flow from the unity of the Father and His Son, but to see a special mention suggests something very close to His heart. Nothing connected with this earth holds any favor more special than His redeemed and their discipleship and tribulation during their pilgrimage. They must be vindicated and the time has arrived. An eighth angel appeared before the altar that had in his possession a golden censer. This was no doubt taken from the great Temple of Heaven of which the Temple of Solomon was but a shadow. Bible students have given only scant attention to this temple. I believe Melchizedek was the high priest of that temple and descended to offer a foreshadow of communion to Abraham. Connecting that golden censor to the temple and the prayers of the saints is especially important. The prayers of the saints would naturally be preserved in the temple for it is the very center of all redemption. The Blood of Jesus Christ is on the altar in that same heavenly temple. This is the very center of the activities of the seven years of the Great Tribulation. The Apostle Paul notes every anointed prayer as special. Prayer has always been the lifeline of His church. "And hath raised us up together, and made us sit together in heavenly places in Christ Jesus." Ephesians 2:6. The power and authorities vested in these great volumes of prayer is quite overwhelming. The angel already held in his possession the prayers of the saints and now receives incense to add and finish this offering ready to be offered. Everything is on hold, silence is evident, and the angel is about to unleash the authority that will affect the universe and all heaven, but the effect will be on earth. It's important to note that this includes the prayers of all saints. This offering is made directly before the throne of the Father, on the very central altar of heaven called, the golden altar. You can rest assured that this is the central most sacred spot of Heavenly Jerusalem and has the attention of the entire Heavenly host. Once this offering is finished, the smoke and aroma ascends up before the Father as an acceptable act of worship. Every prayer in Christ's name, offered by a believing saint, is held in store for action. Sometimes the action is immediate according to the will of God, and sometimes it is preserved until the proper hour; but they are always heard. When I read of the saints of God from Pentecost to the present and see the price in blood that the many martyrs have paid, I get just a little of the emotion that will be manifested on that day. Think of Polycarp, the Huguenots, Hussites, the millions that were slaughtered during the dark ages, and the thousands that were slaughtered by reformation leaders when their dictates were disobeyed. I long for this hour with all those saints that are awaiting vindication. Now, the action will begin on earth. Every prayer prayed by a saint of God as they were led to the stakes to be burned alive or to the waters in which to be drowned or the many other deaths of martyrdom are all stored up for vengeance. I read of a sixteen-year-old young lady that would not recant her faith in Christ alone, who was carried by the inquisitors to a horse trough and held under water until she was dead. Then, her body was cast on the fire to burn. Those inquisitors will be made to bow at her feet and confess her name before the Father. "Behold, I will make them of the synagogue of Satan, which say they are Jews, and are not, but do lie; behold, I will make them to come and worship before thy feet, and to know that I have loved thee." Revelation 3:9. Every debt of every persecutor must be paid. After the prayers had touched the heart of God, this angel took his censor, filled it with fire from the altar, and cast it onto the earth. You can believe that this Tribulation Period now takes on a new level of judgment. Now, the Father and the Lamb are not just judging the earth, they are judging every act of evil against every saint of God for six thousand plus years. The effect is immediate as voices, thundering, lightning, and earthquakes begin to move across the earth from east to west and from north to south. Not one piece of real estate will escape this action. The vengeance of righteousness against wickedness, light against darkness, and purity against impurity will utterly fill the earth. God's saints will be vindicated. This action will continue until the end of the seven years is complete. We should remember that in the final reckoning before our Father, it is not our music or our great sermons, as important as they are when Biblically offered, but the prayers we have prayed. The greatest work of His saints is found in our fellowship and communion with Him. Intercession for the lost, prayer for the multiplying of His words, weeping over the vileness that invades this earth, and wonderful communion with the Father and the Son, is the pure order of righteousness. To allow our works to outpace our prayer life is our shame. More than our labor, He wants our loving togetherness. "And the seven angels which had the seven trumpets prepared themselves to sound. The first angel sounded, and there followed hail and fire mingled with blood, and they were cast upon the earth: and the third part of trees was burnt up, and all green grass was burnt up. And the second angel sounded, and as it were a great mountain burning with fire was cast into the sea: and the third part of the sea became blood; And the third part of the creatures which were in the sea, and had life, died; and the third part of the ships were destroyed." Revelation 8:6-9. A properly blown trumpet is an awesome musical instrument. It can sound incredibly startling when the sounds are meant to startle. At this point in the Book of Revelation, the wicked population of this earth is hell-bent to destroy and eliminate every vestige of morality and any remembrance of the God of Holy Scripture. A new god is being proclaimed and loved, and the new freedom has unfettered the flesh of men to the full satisfaction of their wildest lusts. Its freedom and the new religion is full of the dreams of wealth and pleasure. But even in the midst of their pleasure, the trumpet begins to sound and the earth begins to shudder. The events on this earth are out of control and the very sound of that trumpet is like a wake-up call. When the first angel sounded, the heavens turned black and a storm broke out like midnight on the world. Everyone had heard the trumpet and the storm was so instantaneous that the two could not be separated. The hail was murderous and destructive, killing tens of thousands and literally destroying everything in its wake. To add to its fury, the hail became a mixture of fire and blood falling together with the hail. One third of the earth's trees were destroyed before the storm had subsided and there was no grass left. It was a fire-parched world when it was all over. Without warning and probably no more than a few days, maybe hours later, there is another great sound of a trumpet. The world shuttered again and the world news outlet goes on alert. The earth is struggling to return to normal. Yet, everyone is expecting the worse. Finally, the news gets the story that a great mountain had fallen from out of nowhere burning with fire. It had fallen to the sea and the first release of waves begins to paint the true picture. The sea and, in many places, a third of the earth's large bodies of water has turned to blood. In many places it had congealed and is already an unbearable stench. Pleasure, money, vacation! Nothing matters except survival. The seas of the world are a disaster. At least one third of every creature in the world's bodies of water is dead. At least a third of the ships have gone down with all their crew on board. It is a second disaster on top of the first. "And the third angel sounded, and there fell a great star from heaven, burning as it were a lamp, and it fell upon the third part of the rivers, and upon the fountains of waters; And the name of the star is called Wormwood: and the third part of the waters became wormwood; and many men died of the waters, because they were made bitter." Revelation 8:10-11. Consternation, death, desperate efforts to bury the dead, looting, and scrambling for food is occurring on a worldwide basis. The world is in shock! Days, maybe weeks, pass and then suddenly a third trumpet sounds. The past months have been unbearable and another shock creates utter insanity. As the world watches for the results of this trumpet, the sky turns threatening and a great star is hurling in a path towards the earth. The entire earth trembles and shakes on impact. It had fallen like a lamp full of fire and destruction. Its effect is upon the rivers and all the fountains of water. The sea is already undrinkable, and, now, the water supplies issuing out of the earth are utterly contaminated. Multitudes die as they drink in desperate thirst from the poisoned waters. "And the fourth angel sounded, and the third part of the sun was smitten, and the third part of the moon, and the third part of the stars; so as the third part of them was darkened, and the day shone not for a third part of it, and the night likewise. And I beheld, and heard an angel flying through the midst of heaven, saying with a loud voice, Woe, woe, woe, to the inhabiters of the earth by reason of the other voices of the trumpet of the three angels, which are yet to sound!" Revelation 8:12-13. The trees and green grasses have mostly been parched, the seas and oceans are a disaster, and the water supplies of the world are poisoned. Now, Heaven itself must speak of the judgment of a Holy, but angry God. Millions of His servants have been slaughtered. Godly people have been hated and martyred simply for being Godly. The Father promised vengeance on a rebellious and unbending world and its time has come. The forth angel sounds and the heavens respond. A third of the sun goes black, then a third part of the moon, and then a third part of the stars so that the earth is a black, thick darkness for at least five hours out of every daylight period. Nothing can be more awesome than blackness without a shade of light. Insanity is the only answer for the total universe except for those who know truth and have repented. 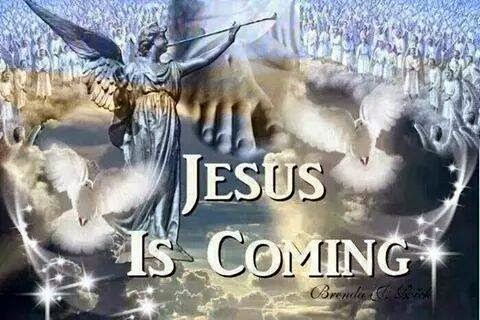 They wait in confidence knowing that the time is short and Jesus will return to establish His kingdom. Suddenly an angel appears in the sky and heralds a message that the world will hear in great sorrow and fear. It's not over and the angel sounds the warning. Everyone will hear the angel's word. There are three woes to go. The angel will declare, "Woe, woe, woe, to the inhabiters of the earth by reason of the other voices of the trumpet of the three angels, which are yet to sound!" Revelation 8:13. The time schedule would suggest that the period of these seven angels is three and one-half years. There will be different events that happen simultaneously and there will be no rest for the world or the wicked. They will surely find places and times to continue their sins and moral rebellion, but each event will only make this world more dangerous. There are still three more trumpets yet to sound. The fifth and sixth are seen in Chapter Nine of this great Book of Revelation. Both of those trumpets opened the gate of hell and turned loose a multitude of the wicked. 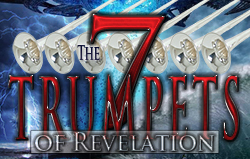 Lastly, the Seventh Trumpet sounds declaring that God's judgment is finished. It's amazing to hear the joy of men and angels as they celebrate the perfection of God's actions. The results of this trumpet are seen throughout the rest of the book. 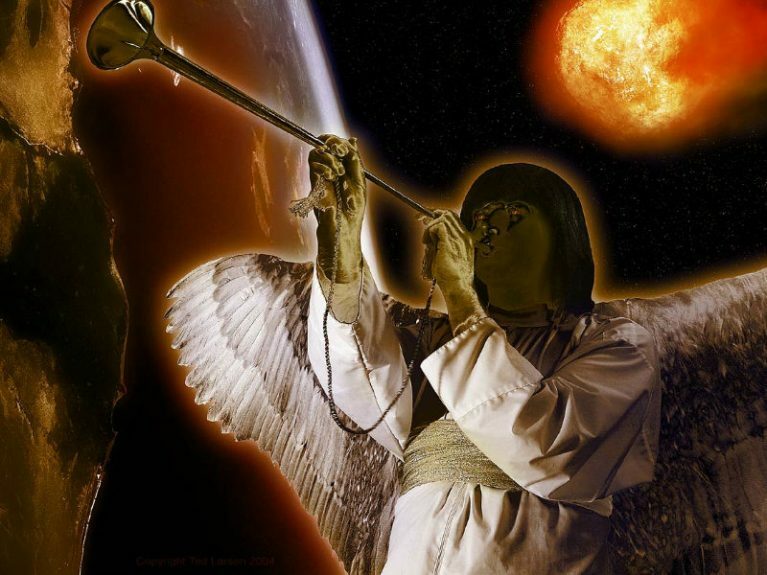 Some have tried to tie this Seventh Trumpet to the Rapture but that is impossible. The Elders are seen as the trumpet sounds and they are present before God worshipping and celebrating the final triumph that follows this blast of the trumpet. There are seven vials to be poured out on the wicked and even the Tabernacle of Heaven is open as priestly angels pour out these vials. It is a glorious scene of perfected holiness preparing the world for its rightful possessor, Christ and His saints.